Blame is meaningless anyway, I remember DHoward in finals not impressed never wanted him here and so happy he's gone, his Atlanta connection didn't work out so its Charlotte's issue, Remember "Looks like Tarzan plays like Jane"? Great team win in Primetimehow ya like that Lebron. This win increases both our standings and the draft position coming up! Remember that inefficient "headcase" KCP that so many of us were disappointed in early in the season? Well, that same dude is absolutely balling since serving his 25-day sentence. I absolutely don't mind seeing him in Laker uniform for 3 more years at this production. See what jail can do? So what do we do about Randle? Each game that goes by he’s becoming more and more of a good but problematic issue. With the way he’s playing he’s gonna get a nice offer. How do we make it work? I've been saying this for years. LA is most likely going to have to solve it's star issue internally. The next all star may not be from free agency and that's ok. Outside of the top top names (Bron, KD, Steph, Harden, AD) you just don't need to chase names like that. Only a handful of guys can simply just dictate the direction of a franchise alone and even they need help. As much as I like Paul George he's just not that guy. He's great in addition to these guys but no way I'm waffling on Randle if it means signing PG. If Lebron wants in that's a different story but paying Randle should be an easy choice at this point. Why keep dropping the youth and potential when I don't know if adding LeBron is enough to beat the warriors anyways. LeBron, Paul and Ingram if he makes even bigger strides on both sides of the ball next year. With lonzo running the offense and filling the stat sheet up. Maybe we'd have a chance but it's all hypothetical, all we know time might hit LeBron hard and fast right after we get him like it did to Nash. Edited by Draztik, March 12, 2018 - 08:58 AM. 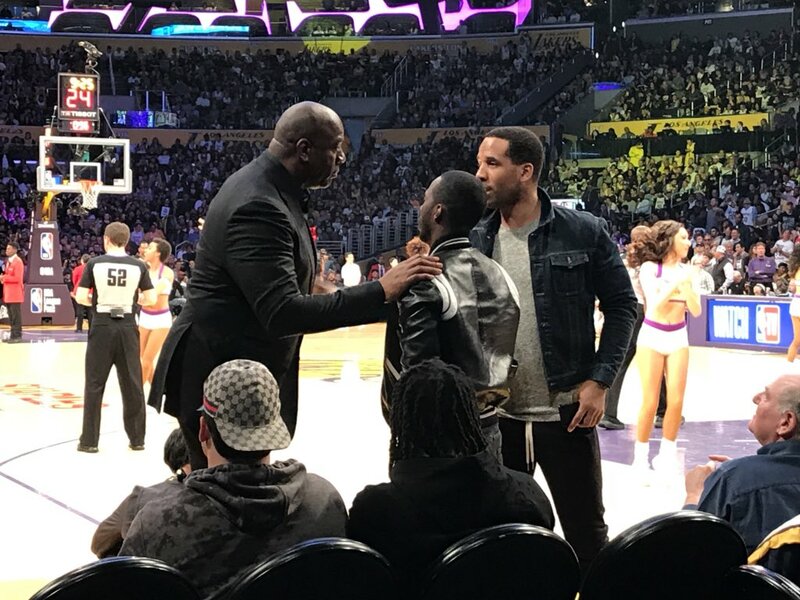 Magic talking to guess who? Definitely talking about keeping KCP... Riiiiiiiight? I don't think this will be popular, but i wonder if the lakers are at least considering the possibility of adding LBJ and Paul (not PG but CP3)? And if they can sign both, then using Ball as any trade to unload Deng? This place is absolutely bonkers after each game. The swings from high to low to "trade X" or "must keep Y" is insane. No way LeBron gets passed up to keep Randle. No way PG13 gets passed up to keep Randle. No way LeBron and PG13 get passed up to keep Randle. That may be the desire of some and that's fine but it becomes RIDICULOUS and absurd when you try to justify it. I agree...however as of right now, the only thing that seperates Randle from a guy like Blake Griffin is a highlight reel and Blake has been to multiple all star games. His ball handling and passing as a PF has reached damn near elite levels. Edited by KidRN, March 12, 2018 - 12:55 PM. Cavs get dominated in 2nd round and Bron looks human in the process. Randle and IT like playing off another and combined cost slightly under Bron. the discussion surrounding Randle has changed so much. Edited by Rekal, March 12, 2018 - 02:25 PM.